We ate a lot when we were in Boston and NYC. There were way too many things we wanted to try. 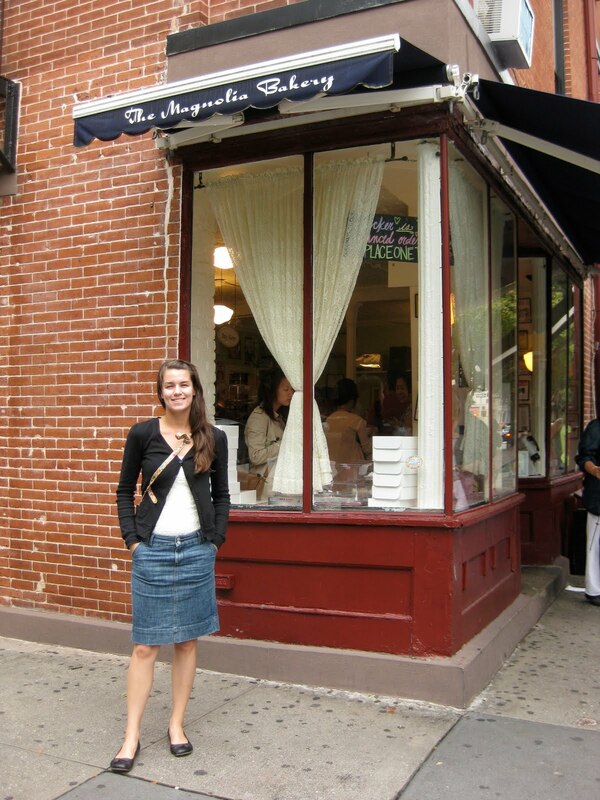 I thought I would start by telling you about all the wonderful bakery type places we tried. The first place (and one he recommended) is a small bakery/cafe in Boston. It is called Flour. He recommended the sticky buns, so that is definitely what I got. Along with some fresh squeezed orange juice. And not that I have tried every sticky bun in the world, but this was the best I have ever had. So soft. Served warm. A nice deep, caramel flavor. Nutty. Really, really good. And they have lots of other baked goods and some sandwiches. Now, to NYC. We had to try the famous Doughnut Plant. It was on my list. It was also recommended by lots and lots of people. The "Plant" in the name is very misleading. This is the smallest little doughnut shop you will ever see. There is enough room for maybe 10 people inside. I don't know if I have told you about the "donut kick" that I recently was on. Luckily, that kick ended several months ago. That does not mean I don't eat donuts anymore. It just means I don't crave them every Thursday morning. Also, luckily, I do not live near Doughnut Plant (or any good donut place actually). Because that kick would be very permanent. So, we test tasted four different kinds. (Test tasted means we just ate them.) First up, Tres Leches. By far the best donut on earth. 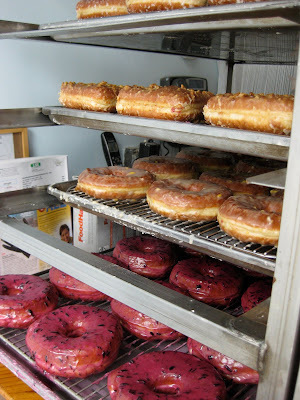 See Mark (genius behind the donuts) did not start selling cake donuts until 2005! He worked on his cake donut recipe for 5 years. And I am kind of a cake donut girl. And Mark is my cake donut maker boyfriend. This is the prefect donut. We tried one more cake donut. The Blackout. This is obviously like a chocolate explosion. It honestly tasted like a brownie. Or like chocolate cake. There is really no excuse to eat this for breakfast. Unless you just convince yourself that this is a donut. And that donuts are breakfast appropriate. But, Scot thoroughly enjoyed this. The easiest way to tell how much Scot likes something is to see how much of it he left on his face. Here is the blueberry yeast donut. 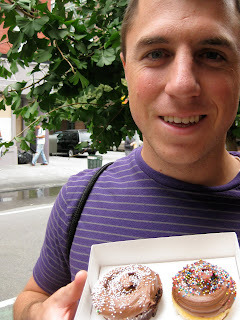 I really liked the yeast donuts too. The dough itself was not super sweet, which I really like since the glaze is so sweet. We liked the texture too. The outside "crust" is very chewy. And last, a jelly filled donut. This was blackberry filling. I have never liked jelly filled donuts because there is always too much filling. I like a little filling, with mostly donut. These donuts are genius because they have a thin tube of filling that runs along the entire length of the square donut. It is like the perfect bite every time. Yum!!! Next, we had to check out the Magnolia Bakery. It is famous. Gotta do it. The one we went to was tiny and so packed with people. I love that because it makes you know you picked the right place. They have all sorts of cakes and desserts, but we kept it simple by trying their famous cupcakes. I was slightly disappointed that we could only pick from some traditional flavors (chocolate cake/chocolate frosting, white cake/white frosting, yellow cake/chocolate frosting, etc.) You have to place an order to get the more exciting flavors. However, it was a delicious cupcake. And didn't have a ridiculous amount of frosting on it. I am not a fan of the equal amounts frosting and cake. I like just a little frosting. I think I still took some off. But I am picky. It was good frosting too. Definitely a fun experience. We also tried out Momofuku Milk Bar. I was pretty excited about this place. I had heard a lot about it. It is a bakery, but not really at all. The pastry chef tries to stand on the boundary of genius and disgusting. The menu is made up of crazy soft serve ice cream flavors, delicious cookies and cakes and a few interesting drinks. We got a sampler of all the ice cream flavors and toppings. Starting with the purple one on the bottom (in above pic) we had: purple drink, cereal milk, BBQ sauce, creamed corn, corn flake toppings and potato chip topping. Now, at first bite, each ice cream was so intriguing. Very interesting to get your brain and taste buds to realize what is going on. But, after a few bites, I had a really hard time with the BBQ one. Secretly almost made me gag. Then, there were two problems. One, I hate cereal milk. I never drink the milk after I eat my cereal (something that Scot totally does not approve of). To me, it is kind of like drinking something out of a bottle and then when it is gone, refilling it with water without washing it out. So, it kind of tastes like what you just had in the bottle, but not really. On one hand, I was like, "awesome, you totally replicated the taste of cereal milk and made an ice cream out of it." On the other hand, I was like, "why did you make ice cream out of it?" 100 points for creativity. Second problem is that I am not a huge fan of creamed corn. I mean sure it is a pretty good side dish. I mean I will eat it. But it isn't like the most amazing flavor ever. Not really sure why I would want it in ice cream for. But, it did taste spot on like creamed corn. And I actually really liked the purple drink flavor. Tasted like Koolaid. It was a fun spin on a child hood favorite. We also tried one of the cookies. The compost cookie. It was really good. Has like a million things in it: butterscotch chips, potato chips, pretzels, etc. Really soft and chewy. I totally enjoyed our experience at Momofuku. It was fun to try crazy ice cream flavors. And lastly, back to Boston, we got cannolis at Mike's Pastry in North End. They were delicious (and huge). I couldn't eat all of mine. From what I hear, Mike's Pastry is most known for their cannolis, but they have all sorts of baked goods and desserts. We went with cannolis and were not disappointed. It is also cool how they tie your box up with string hanging from the ceiling. And this place is so packed. We went on a Monday night and didn't have to wait too long (maybe 10 minutes with some aggressive ordering). But we walked by it again on Saturday and the line out the door was ridiculously long. Lastly, I don't have a pic for this, but we got some amazing ice cream at Toscanini's in Boston. I got Vietnamese coffee ice cream and Scot got Hydrox cookie ice cream (apparently Hydrox was the original Oreo, but Oreo stole it or something...) I also tried the Burnt caramel flavor. So good! They had lots of interesting flavors. Wish I could have tried more. sounds like a tasty trip! And I'm jealous that you went to Mesa Grill in NYC. We went to the one in Vegas and it was awesome. OMG...this is just too funny...but what a great way to spend time on your trip...good job!!! So now I have to go back to NYC and Boston...because I somehow happened to miss both Flour and the Doughnut Plant...I'm so bummed because everything looks so good! i love doughnuts. sometimes i try to convince myself that it would be okay to go to the grocery store just to get a doughnut, and then like maybe some mushrooms so the cashier doesn't judge me. but i don't. i think i might.